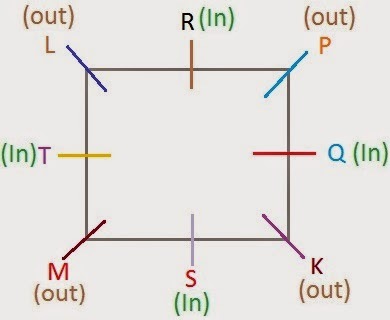 K, L, M, P, Q, R, S and T are sitting around a square table in such a way that four of them sit at four corners of the square while four sit in the middle of each of the four sides. The ones who sit at the four corners face outside while those who sit in the middle of the sides face the centre of the table. P sits third to the right of S. S faces the centre. Q sits third to the left of M. M does not sit in the middle of the sides. Only one person sits between Q and R. R is not an immediate neighbour of M. T faces the centre. K is not an immediate neighbour of R.
1. What is position of M with respect to L? 2. Who sits exactly between Q and R? 3. Which of the following pairs represents the persons seated in the middle of the sides who face each other? 4. Who among the following sit between R and K when counted in anti-clockwise direction from K? 5. If K is made to face the opposite direction, who would sit to his immediate right? Pls check the ans for Q.4...in the question it is mentioned anti-clock wise, but the ans is given in clock wise. Kindly have a look on the last word of the question, FROM K, ie start counting from K to R ccw. Pls check the Q.No.4, answer is given considering the clockwise direction instead of anti-clockwise direction I believe.